The AER800-PWR is the power distribution module for AER800-4P-BOX, AER800-8P-BOX or AER800-24P enclosures. It gets remote power from an AEC-x power supply on a spare power pair and then provides power to subscriber modules. Formerly known as AER800-POWER. Use with ADSL modules only. 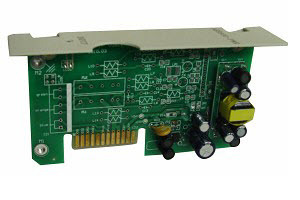 Inserts into enclosure to power up to eight ADSL modules. Requires AEC-x power supply 122vDC. Use with ADSL line cards. Operating Temperature: -40? ? +60?